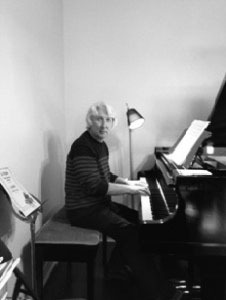 Growing up in Moscow, Russia, in 1959 at the age of 6 I was attending private music lessons for piano which led me to get accepted into the Moscow School of Music by the time I turned 8. There I studied piano and gained full knowledge of musical literature, harmony, solfeggio, choir and overall musical theory. By age 11, I started taking not only piano, but also clarinet lessons, which allowed me to perform in a symphonic orchestra. It was so exciting to learn such various aspects of music, that I starting looking at a future career in this field. At the age of 15, after I graduated music school with honors, I was accepted into the Ippolitov-Ivanov State Musical Pedagogical Institute. There I was introduced to many advanced musical subjects. I studied conducting, musical history and culture. Being a pedagogical institute, I was also trained to teach music and learned the required techniques to teach and inspire children as young as age 3. I even began teaching at the same schools I once attended. By 1973 I graduated from The State Musical Institute and having such an exposure and affinity to music allowed me to pursue my career as a musician at a Children’s Musical Theatre and teacher at the Moscow School of Music. Having 20 years musical teaching experience in Moscow, I immigrated to Canada in 1996 and knew I could not let my past career go. Learning English, I began to teach at various private music schools throughout the greater Hamilton area. I taught students with ages ranging from 5 up to even seniors. I was able to teach not only piano and musical theory, but also clarinet, saxophone and flute. In 2012 the Royal Conservatory of Music awarded me a Gold Medalist Teacher for saxophone.